I don't know about you - but I'm feelin 25! Yesterday, the 29th of January in the year 2015 - I turned 25. 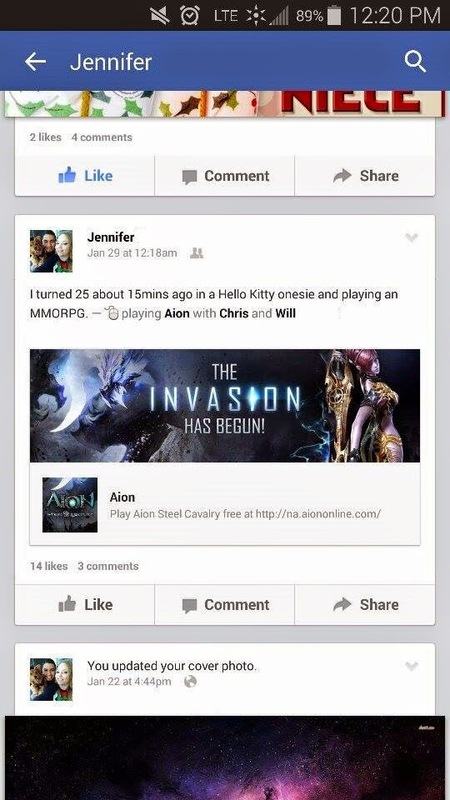 And I did it wearing a Hello Kitty onesie and playing a video game. Not much has changed since I was 15. This birthday felt different though - much more adult-like? I suppose? I had to work from 9 - 5:30, and Chris didn't get off of work until 7:30pm. I don't know, it was my birthday but didn't feel like it. Probably because I did end up having to work for so long, and I had homework to complete that night. I have to say I absolutely love my friends and family though - so many of them texted/called/facebook'd me saying 'Happy Birthday!' It was so nice of everyone to take some time out of their day for me! My parents actually came up and we all went out to this local Chinese place to eat some dinner. It was so delicious and I'm so glad that they were pushy and decided to come and visit me even though I told them they didn't have to. And I completely forgot that since it fell on a Thursday it was #tbt. When I got off of work and got into my car - the local radio station was playing ALL of my favorite throwbacks. I was gettin' it a little too hard on the way home because I missed a green light. Yeah. I was that girl. And I still do not even care. My friends sent me funny snaps all day - and I sent back terrible videos of me dancing in the car to the one pictured above. I mean - I know she's doing the same thing in her car when she gets the chance. And she probably was laughing at my ridiculous antics. My coworkers were also lovely because they got me a delicious chocolate cheesecake from the cheesecake factory - and it came with a giant hunk of chocolate on top to eat! After we all resigned to realize that there was no way we could eat all of that cake - my coworker and I finally went out to lunch! We ended up at Ruby Tuesday and yum yum yum! I love their salad bar - but the jalapeño burger I ordered was more sweet than spicy and a big letdown. But I wasn't going to let one measly burger keep me down! 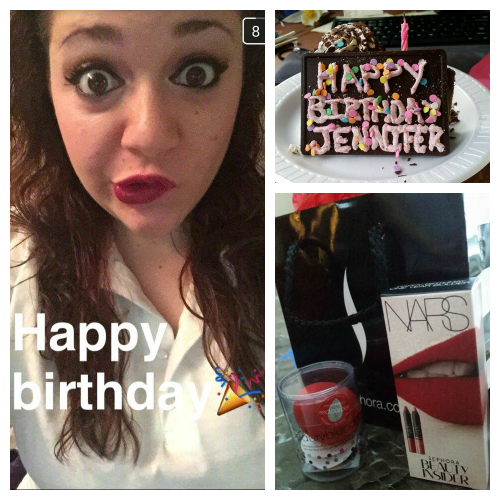 And of course - a birthday wouldn't be complete without from freebies from Sephora! I finally went and bought myself a beauty blender and picked up my awesome birthday gift. I was happily surprised when she popped the Nars lipsticks in my bag. I didn't realize they I would be getting some really gorgeous samples. I'm going to feel guilty using them now! Overall, my birthday was AMAZING. And I want to say a big THANK YOU to all of you who said Happy Birthday. You all are amazing - even if you didn't wish me a happy birthday - you are amazing anyway! Birthday's always feel weird to me! There is something weird about that day -I can't explain it. Mine is on Easter Monday this year - probably weird again! Birthdays are always esp weird when they fall on Holidays! I was born on Super Bowl Sunday here - my Dad watched the football game while my Momma was giving birth! Haha!